Trent Alexander-Arnold has signed a new contract with Liverpool, keeping him with the club until 2023. The impressive defender, who has also played for England in recent months, is considered one of the world's best young wing backs. Liverpool manager Jurgen Klopp has moved quickly to tie Alexander-Arnold down to a fresh deal. The defender, who is currently out of action through injury until March, has caught the eye of some of Europe's best clubs. However, the deal will tie the defender down to the Anfield club for the next four years. 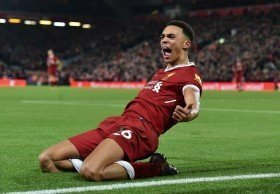 “I’m ecstatic and really proud,” Alexander-Arnold told the club’s website. “I feel privileged to have the support and the trust the club has in me to offer me a new deal. Liverpool have been building their new defence around Virgil van Dijk, but Andy Robertson and Trent Alexander-Arnold are likely to play alongside the Dutchman for many more years to come.